Quilting is a method of stitching together two layers of fabrics with or without an interlining of some material to form a textile sandwich. The stitching holds the fabrics and the interlining material in place and also serves as the basis for decorative designs. Quilted fabric or quilt constructed fabrics are used for blankets, mattress covers, and also clothing, upholstery, and decoration. The quilt fabrics and the interlining material provide substance (mass), insulation, stiffness and textured effect. The quilting fabrics are cotton, artificial silks, rayon and polyesters. The interlining materials are fluffed cotton or polyester, rayon staples, shoddy wools and animal hairs, bird-feathers, polypropylene woven and non-woven sheets, coir, etc. 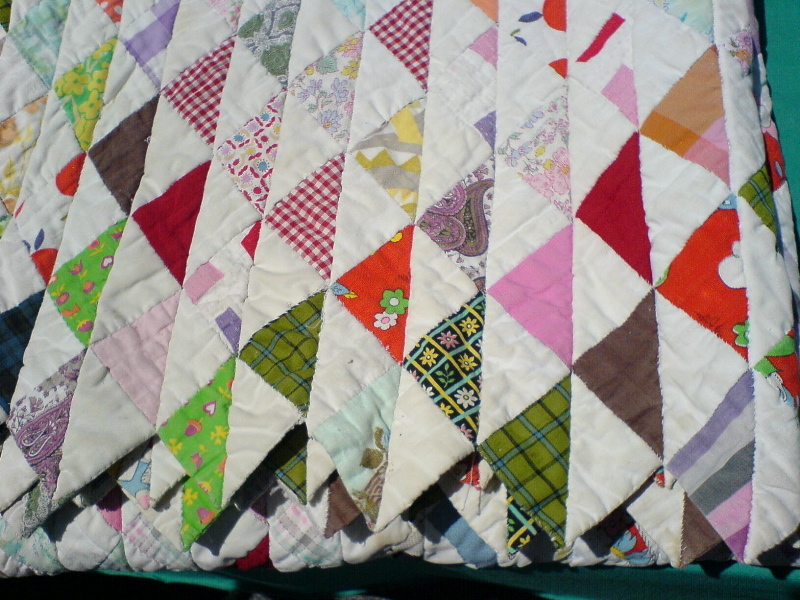 Poor in India use discarded clothing pieces to form quilts. The Quilting or joining the fabric and the interlining is done by continuous machine or hand stitches as well as continuous or spot knotting. Modern quilting is done by heat fusion setting or chemical bonding. The Stitch-lines and knots create regular or irregular patterns like squares, diamonds, spirals, etc. The Quilting fabric could be same on both sides or plain one on the bottom side. The top fabric is often plain so that the quilting stitches form the design. The top fabric is printed or created by joining small pieces of fabrics to create an appliqué or patch work. Quilting is very ancient craft. Quilted garments were extensively used In China, Russia, and Pre-Columbian Meso-America for warmth. Quilted fabrics were used as armour. Crusaders from western Europe were introduced to quilting when they encountered Saracens in the Holy Land. Saracen foot soldiers wore straw-filled, quilted canvas shirts as a form of armour, and horsemen used quilted silk under-shirts to prevent their armour from chafing. 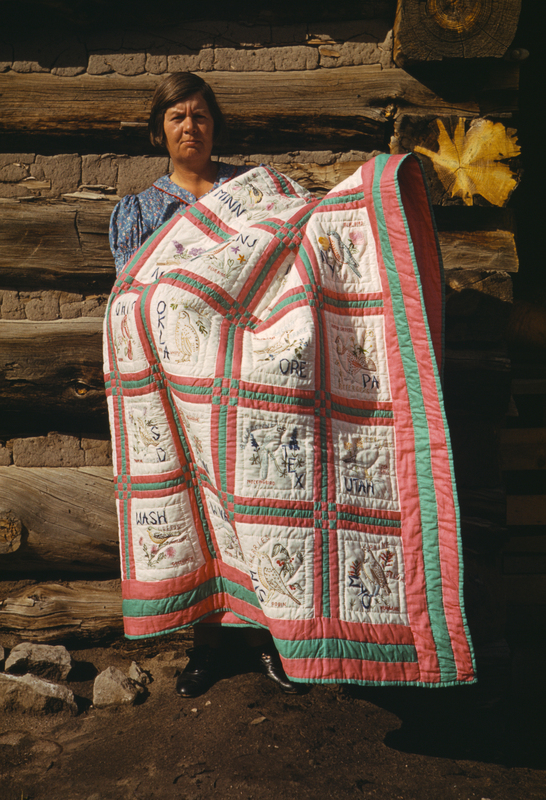 Dutch and English colonists brought quilting to America in the 17th C. The first American quilts were made by the appliqué method. Archaeologists discovered a quilted floor covering in Mongolia, estimated to be of between 100 BC to 200 AD. Molas are handmade using a reverse appliqué technique. Several layers (usually two to seven) of different-coloured cloth (usually cotton) are sewn together; the design is then formed by cutting away parts of each layer. The edges of the layers are then turned under and sewn down. Often, the stitches are nearly invisible. This is achieved by using a thread the same color as the layer being sewn, sewing blind stitches, and sewing tiny stitches. The finest molas have extremely fine stitching, made using tiny needles.